Phew! It’s taken me a long time to write this post. I haven’t been too sure what to say about The Magus. It’s one of those books that has left me speechless. This is the fourth book that I’ve read for the Pay It Sideways Challenge. After reading this intriguing post by The Book Whisper, I couldn’t wait to get hold of a copy to see what all the fuss was about! I was pretty daunted before reading the book, and even downloaded a dictionary app, so that I wouldn’t have to pester whoever happened to be around while I was reading to tell me what words such as ‘acroterion’, ‘kylix’, ‘ormolu’, ‘detumescence’ and ‘algesonic’ meant. I could go on, but would prefer not to show off just how limited my vocabulary is. So, there are quite a few difficult words in the book, but was I, as The Book Whisperer promised, ‘blown away’ by it? Well, not really. To begin with, the storyline seems quite interesting. The narrator, a pretentious Oxford graduate called Nicholas Urfe, is feeling restless in London and takes on a teaching job on a remote Greek Island. Before he leaves, he meets Alison, an Australian who, although not often seen in the book, plays a very important role. I quite enjoyed reading about Alison and Nicholas’ dysfunctional relationship, although I found Nicholas extremely irritating, arrogant and immature. I hoped that he would grow up a bit at some point in the course of the story. Unfortunately, Nicholas seemed to become worse, or perhaps my patience just started to wear thin. His narration was self indulgent and cringingly pretentious. The story itself is intriguing and does draw you in. I read it at the beginning of the summer when we were having some particularly hot weather and the descriptions of the island and the dreamlike quality of some of the chapters were wonderful. As time goes on, the island gradually becomes a surreal place to Nicholas. At first the atmosphere transforms with brilliant subtly, it might be something as simple as the distant sound of singing or a certain smell. There is a great sense of stepping into a magical world. And then Nicholas meets Conchis, a mysterious man living on the other side of the island. Their meetings start off with interesting puzzles and riddles, filling the reader with curiosity, but as time goes on it becomes obvious that Conchis has some sort of complex ‘game’ that he wants to play with the younger man. The ‘game’ progresses to more and more extravagant levels, and even introduces new players. The subtlety that gave such readable atmosphere at the beginning changes into a more nightmarish and confusing read. It is impossible to know what is true and what is make-believe. The Magus does push the boundaries in a sense. Conchis plays with Nicholas’ mind and John Fowles plays with the reader’s. At times I believed that the book was filled with magic, at others that Nicholas had gone mad and sometimes I was completely taken in by certain tricks. I didn’t necessarily dislike these confusing thoughts, but I did think that they went on for much too long, to the point of me ranting about how it was never going to end! The only reason I kept reading to the very last page was because I hoped that there might be some straight forward answers. I was disappointed – or maybe angry might be a better word for it. I’m not sure that The Magus is supposed to be enjoyed. I think it’s a book that is supposed to make you “think”, but for the life of me, I’m not sure what about. People have described it as “rich” and “thought provoking”, but I see it as no more than the sexual fantasies of an educated twerp surrounded by a load of philosophical twoddle to make it seem more meaningful. If you would like to try it yourself, you can click on the picture below. But my advice – Don’t waste your money! I’ve read, and liked, The Collector and The French Lieutenant’s Woman. but I was never brave enough to try this one. Not my sort of book either. I’m definitely going to read The French Lieutenant’s Woman at some point. I’ve heard it’s a really good book. Apparently it’s nothing like The Magus too… Maybe I should have started with that instead! Well I’m glad I haven’t put you off! It’s probably worth a read, but just be ready for a rubbish final few chapters. If you ever do read it, I would be interesting in reading your opinion! 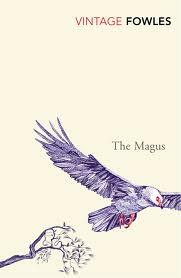 The Magus is more of an experience, than a book, in my view. I loved it for the qualities you mention — the dreaminess, the strangeness. It’s also madly flawed and falls in a giant heap towards the end. It’s a great shame about the giant heap towards the end! I was actually rather enjoying it. After about halfway though I started to get annoyed by it. And then it didn’t seem to want to end! When the end finally did come, I found it really disappointing – especially after I had stuck with it for so long! I have read The Collector and A Maggot and am getting ready to read The French Lieutenant’s Woman. I enjoyed the first two. I may have to give The Magus a try. Apparently The Magus is very different from his other work. I’m still ready to read other books by this author, I just hope they have slightly less annoying main characters! Thanks! I’ve heard The French Lieutenant’s Woman is really good, but I might not try to for a little while now! Hmmm… this sounds like a serious case of “you read it so we don’t have to” – so thanks for sticking with it! I think it’s a bit of a you love it or hate it type of book. Also, lots of people said they liked it in their twenties but hated it later on in life. I’m in my twenties though, so not sure what that says about me!